Itinerary "A Walk in the Park"
Assemble in Oshawa Masonic Temple for parade for Opening Ceremonies. Masons, York Rite, Scottish Rite, DeMolay, Eastern Star, and Shriners in Regalia. March from Temple once around the block and up onto the stage of the Bandshell. 12:00 PM Jumping castle, dunk tank, memorabilia sales, food and beverage and all booths manned and opened. 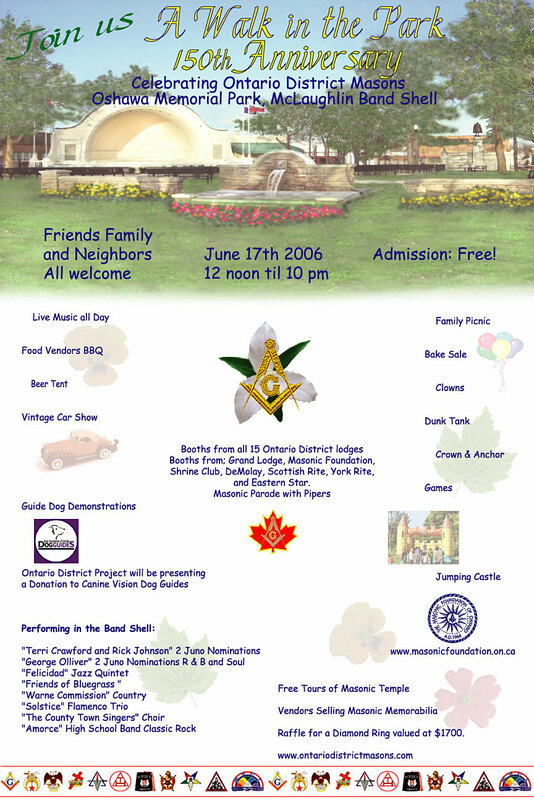 2:00 PM - 2:45 PM "The Friends of Bluegrass"
3:45 PM - 4:00 PM "The Oshawa & District Shrine Club Oriental Band"
5:00 PM - 6:00 PM "Canine Vision Canada" Dog Guide demonstrations and presentation of cheque for District Project. 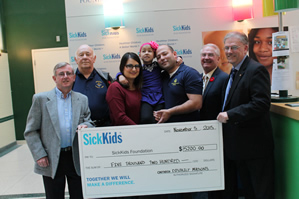 7:00 PM - 7:15 PM Thanks to members of Ontario District, the City of Oshawa and all concordant bodies for their support. 7:15 PM - 8:30 PM "George Olliver" the Blue Eyed Prince of Soul. 8:45 - 10 pm "Terri Crawford and Rick Johnson" - Rock and Roll. 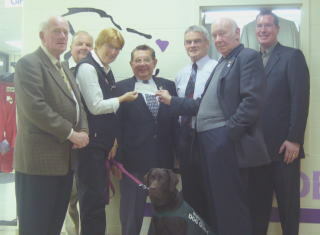 and one of the Canine Vision Canada Dog Guides. Brethren: today, R.W. Bro. Mark Smith, DDGM: W. Bro. John Wallace (Ontario District Masonic Association President) : V.W. Bro. Gord Smith, Association Asst. Secy: W. Bro Glenn Carr, Lebanon Lodge No. 139, and W. Bro. Basmaji, Lebanon Lodge No. 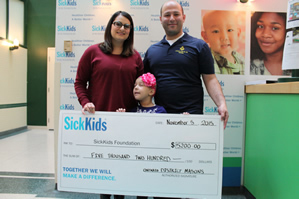 139 accompanied by Anabelle and Abby Basmaji presented Sick Kids Hospital with a cheque for $ 5,200.00 representing the funds raised by the Masons in Ontario District to honour Anabelle, who is currently being treated at the Hospital for Leukemia.